BACKGROUND. 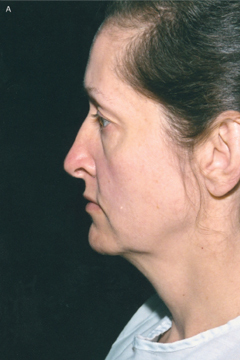 As the human face ages, there is a depletion of fat that occurs in the submalar region. 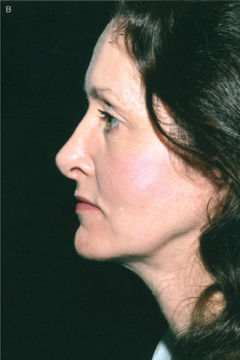 Various techniques such as fat transfers, fillers, alloplastic implants, and composite rhytidectomies have been used to augment this area in the past. OBJECTIVE. To describe a technique that augments the submalar areas during facelift surgery without the use of fat transfer, fillers, alloplastic implants, or a risky composite technique. METHOD. An oval is scribed over the depressed submalar areas preoperatively. 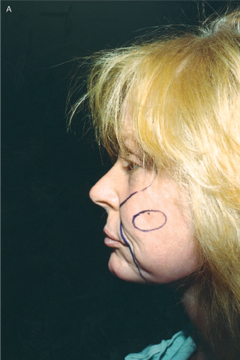 During facelift surgery, a fusiform area is scribed over the SMAS. This fusiform is scribed so that the medial end is directed at the center of the submalar depression, and the lateral end is toward the posterior earlobe. A defect is created within the lateral aspect of the fusiform, but not the medial portion. The fusiform is subsequently closed with a 2-0 Ethibond suture using three horizontal mattress sutures and two interrupted sutures. Upon closure of this defect, SMAS, subSMAS, and subcutaneous tissue overlying the SMAS are recruited into the submalar defect by the simple phenomenon of dog-ear formation. Additionally, there is a component of frank elevation of the tissues inferior to the medial aspect of the fusiform and submalar space. RESULTS. The aforementioned technique has been performed on 123 patients over 7 years and has resulted in consistently good improvement in the submalar space. The procedure is not difficult to learn, and good results can be achieved with initial cases. The learning curve was not found to be steep, with good results being achieved quickly. CONCLUSION. Depression of the submalar space plays a significant role in creating an aged face. In the past, various fillers and/or alloplastic implants have been used to augment this region. A low-risk method is described that mobilizes SMAS, subSMAS, and subcutaneous tissues into the submalar space through the phenomenon of dog-ear formation after fusiform closure. DOMINIC A. BRANDY, MD HAS INDICATED NO SIGNIFICANT INTEREST WITH COMMERCIAL SUPPORTERS. NO ONE knows exactly who attempted the first facelift, but there is little doubt that many surgeons in Europe and America performed the operation in the early 1900s. Stephenson1 credits von Hollanden with publishing the first article on facelifting in ‘‘Handbuch von Kosmetick’’ by Max Joseph in 1912. Around this same time, there was much interest in facial surgery by such eminent surgeons of Lexer,2 Joseph3–5 in Germany, Passot,6,7 Morestin,8 Bourguet9 and Lagarde10 in France. Madame Noe¨l,11,12 a Parisian surgeon, devoted most of her professional life to facelifting and was noted for her minor office procedures. These facelifts were very minimal in the extent of undermining and did not address the three-dimensional aspects of aging. 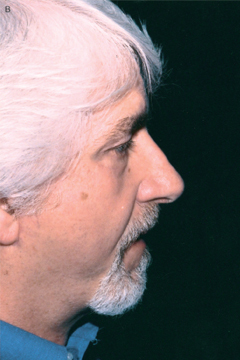 Certainly, the facelift published by Passot7 in his ‘‘Chirurgic Esthetique du Visage’’ was strictly two dimensional and was extremely limited in the extent of undermining (Figure 1). Figure 1. Possibly the first description of a facelift. This drawing was copied from Dr. Passot’s book La chirurgie esthe´tique des rides du visage, which was published in 1917.
plicated or imbricated. The excess skin was removed, and the wounds were closed. Figure 2. Schematic demonstrating the commonly known phenomenon of dog-ear formation after fusiform closure. Webster et al.16–19 had the most profound influence on the dermatologic surgeon, preaching a conservative undermining with SMAS plication. His technique was further expounded on by dermatologists Scarborough and Bisaccia.20 However, with all of these aforementioned approaches, little attention was given to the decrease in volume that occurs to the bone, muscle, and fat that occurs during the aging process. In more recent years, cosmetic surgeons have begun to look at the face more three dimensionally, with the cheek region receiving a great deal of attention. Binder21 was one of the first to pay special attention to the depletion of fat that occurs at the submalar space as one ages (Figure 2a). To address this problem, he developed alloplastic submalar silicone implants that were shaped to fit the submalar space and were procedurally designed to be placed through Caldwell Luc incisions. These implants have been used by the author and have been found to give very good improvement of the submalar depressions. There is, however, a fear by some patients about having foreign material permanently inserted into their face. Another way to augment the submalar space is to inject fat. As this technology has grown in popularity, so has the interest in filling the submalar space. Sommer and Sattler22 developed a technique in which autologous fat is dried over sterile swabs and is frozen at –201C for up to 2 years and is then thawed and injected monthly into the submalar space until a permanent result takes effect. This technique has been found by the author to take anywhere from 1 to 10 sessions until permanency of the result takes effect. The primary advantage of this technique is that patients do not need to be significantly overaugmented to achieve the desired result. Figure 3. (a) Before the procedure is performed, it is critical to draw an oval over the area of the submalar depressions. (b) After the technique the area of depression is augmented. Although fat transfer can give very good results, some patients do not like the fact that there is the requirement for many visits and the results are sometimes temporary. 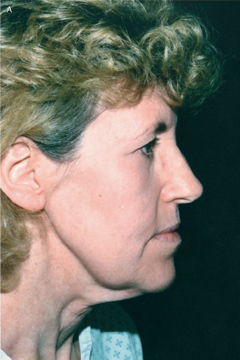 Because of the fact that submalar augmentation is required in many aging faces and there are these aforementioned deficiencies with current techniques, the author has developed a facelift technique that mobilizes SMAS, subSMAS, and subcutaneous tissues overlying the SMAS into the submalar area through the phenomenon of dog-ear formation after fusiform closure (Figure 2) and does it with little to no risk. The use of fat, fillers, alloplastic implants, or composite rhytidectomy is thus avoided. period. Hamra recommends that patients take off 4 to 6 weeks and tells them that optimal results will take 6 to 12 months because of the slow resolution of edema. Although composite rhytidectomy does elevate cheek fat into the submalar space, it does it at a high price. The patient is brought into the preoperative room, at which time all questions are answered and consent forms are signed. The proposed incision lines at the preauricular and postauricular areas are scribed with the appropriate ink. Figure 4. A fusiform is scribed during the procedure. The medial end of the SMAS fusiform should be at the center of the depressions and the lateral point at the posterior earlobe. A defect is created within the lateral portion of the fusiform, but not the medial aspect. The lateral point should be pointed to the posterior earlobe where the dog-ear effect will not be as visible. A defect is made only within the lateral aspect of the fusiform. The medial aspect of the fusiform is left alone before closure. Figure 5. Schematic showing the position of the fusiform closure in relationship to the submalar depression. Figure 6. Upon closure plication, there is a mobilization of the SMAS, subSMAS, and subcutaneous tissue overlying the SMAS into the submalar space by the phenomenon of dog-ear formation after fusiform closure. There is also a degree of frank elevation of the tissues below the medial aspect of the submalar depression. Plication is accomplished with three horizontal mattress 2-0 Ethibond sutures and two interrupted sutures. Additionally, the author indicates the areas of desired submalar augmentation by drawing an oval over the areas of submalar depression (Figure 3a,b). 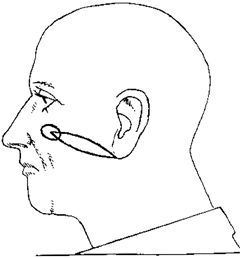 This scribing of the depressed regions of the cheek is the most critical part of the procedure. These ovals must be drawn as symmetrically as possible so as not to create facial imbalance postoperatively. Figure 7. Intraoperative shot demonstrating the right side after fusiform closure and the left side not yet operated upon. Notice the significant augmentation of the right side as compared with the left. The appropriate facelift incision is made, and the skin is then undermined in the fashion that the surgeon desires. With this technique, however, it is important to undermine beyond the oval drawn over the submalar depression. Once the undermining is completed, a straight line is drawn over the SMAS from the middle of the oval to the earlobe. This is carried through by placing the scribe directly underneath the skin where the oval is drawn and then dropping the pen onto the SMAS where a mark is made. 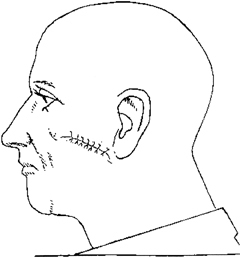 A straight line is then drawn from this mark to the base of the earlobe. Figure 8. 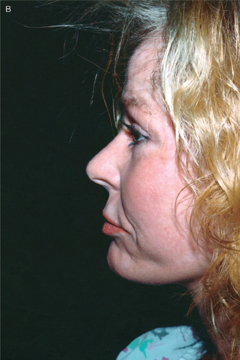 (a) A patient before facelift surgery from the lateral view. (b) After the technique described in this article. The patient also had rhinoplasty and blepharoplasty. midline would be scribed over the SMAS (Figure 4). As previously stated, the width of this fusiform will be dependent on SMAS laxity, and the medial end of this fusiform will be directly at the center of the oval drawn preoperatively (Figure 5). The lateral portion should end at the base of the earlobe. making sure to attain SMAS tissue within the surgical sites (Figure 6). This plication is performed by initially placing a horizontal mattress suture at the edge of each side of the fusiform at the midline. After this is completed, horizontal mattress sutures are placed at the halfway point between the end and middle of the fusiform. Single stitch interrupted 2-0 Ethibond sutures are then placed in between these sutures. When the first fusiform is closed with the 2-0 Ethibond, there is an easily observed improvement in the submalar depression on the side that was operated on (Figure 7). Figure 9. (a) Another patient before surgery from the lateral view. (b) After the technique described in this article. Note the augmentation of the cheek. The patient also had blepharoplasty. better location. After it is felt that the desired result is acceptable, the excess skin is removed, and the wound edges are closed in the fashion of choice. not very steep at all, with good results being obtained very quickly in the learning process. directed appropriately, an augmentation will occur in an area that is not desired. It is believed by the author that the primary way that this techniques works is by mobilizing SMAS, subSMAS, and subcutaneous tissues overlying the SMAS via the phenomenon of dog-ear formation. The dog-ear creates augmentation of the submalar space without the use of fat or alloplastic implants. There is also a component of frank elevation of the tissues inferior to the medial aspect of the fusiform defect, which also helps create some submalar augmentation. Figure 10. (a) Another patient before surgery from the lateral view. (b) After the technique described in this article. Once again, notice the submalar augmentation. It must also be noted that the lateral aspect of the SMAS fusiform will also create some dog-ear augmentation. That is why is it critical to make sure the end is at the posterior earlobe area where it will not be noticeable. when analyzing the technique from an anatomical or physiologic vantage point. In regard to the degree of augmentation that this technique will give, it must be stated that it will not give the same degree that a large submalar implant will give, but its augmenting effect is comparable in most cases to the augmentation of a small- or medium-sized submalar implant. If the surgeon wants to use a submalar implant for additional augmentation, there is no contraindication. Additionally, if fat transfers want to be used after the procedure for increased augmentation, this decision would be totally prudent. 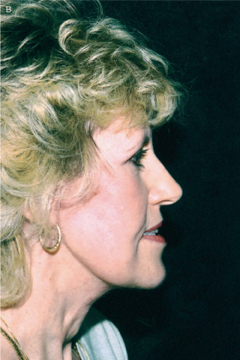 The author describes a simple technique that can be incorporated into conservative or extensive facelift surgery and has been found to improve consistently the submalar depressions of aging without the use of fillers, alloplastic implants, or risky composite rhytidectomy. The technique involves mobilizing SMAS, subSMAS, and subcutaneous tissue overlying the SMAS through the phenomenon of dog-ear formation after a fusiform-shaped defect of the SMAS is closed. Because the medial aspect of this fusiform is directed at the middle of the submalar defect, significant augmentation can ensue in the cheek region. 1. Stephenson KL. ‘‘The mini-lift,’’ an old wrinkle in face-lifting. Plast Reconst Surg 1970;46:226. 2. Lexer E. Zur gesichtsplastik. Arch Klin Chir 1910;92:749. 3. Joseph J. Plastic operation on protruding cheek. Dtsch Med Wochnschr 1921;47:287. 4. Joseph J. Nasenplastik and sonstige gesichtsplastik nebsteinen anhang u¨ ber mammaplastik. Leipzig Curt Kabitzsch 1928;525–7. 5. Joseph J. Verbesserung meiner Ha¨ngemangenplastic (Melomioplastik). Dtsch MedWochnschr 1928;54:567. 6. Passot R. La chirurgie esthe´tique des rides du visage. Presse Med 1919;27:258. 7. Passot R. La chirurgie esthe´tique pure (technique et re´sultats). Paris Gaston Doin Cie 1931;176–80. 8. Morestin H. La re´duction graduelle des de´formities te´gumentaries. Bull Me´m Soc Chir Paris 1915;41:1233. 9. Bourguet J. La chirurgie esthe´tique de la face. Le Concours Me´d 1921;1657–70. 10. Lagarde M. Nouvelles techniques pour let traitement des rides de la face et du cou. Arch Franco-Belg Chir 1928;31:154. 11. Noe¨l A La Chirurgie Esthe´tique Son Role Social. Paris Mason Cie 1926;62–6. 12. Noe¨l A La Cuirurgie Esthe´tique. Clearmont (Oise): Thiron et Cie, 1928. 13. Mitz V, Peyronie M. The superficial musculoaponerotic system (SMAS) in the parotid and cheek area. Plast Reconstr Surg 1976;58:80. 14. Adamson JE, Horton CE, Crawford HH. The surgical correction of ‘‘turkey gobbler’’ deformity. Plast Reconstr Surg 1964;34:598. 15. Rees TD, Aston SJ. Clinical evaluation of submuculoaponeurotic dissection (Skoog) in face lift surgery. Plast Reconstr Surg 1978;5:1. 16. Webster RC. Conservative facelift surgery. 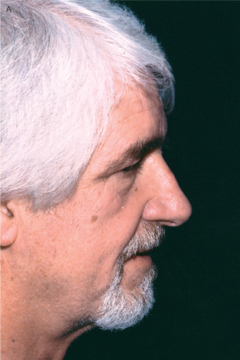 Arch Laryngol 1976;102:657–82. 17. Webster RC, Davidson TM, Nahum AM. Facelift, Part 1 San Diego Classics in Soft Tissue and Cosmetic Surgery. San Diego: American Academy of Facial Plastic and Reconstructive Surgery, 1976. 18. Webster RC, Davidson TM, Nahum AM. Facelift, Part 1I: San Diego Classics in Soft Tissue and Cosmetic Surgery. San Diego: American Academy of Facial Plastic and Reconstructive Surgery, 1976. 19. Webster RC, Brown CA, Hilger PA, Smith RC. Comparison between short and long term results in face lifts. Aesthetic Reconstr Facial Plast Surg 1978;5:1–98. 20. 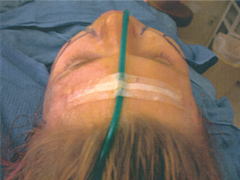 Scarborough D, Bisaccia E. The Webster-type face and neck lift: an extensive crevice-facial rhytidectomy employing a minimally invasive technique. Dermatol Surg 2001;27:747–55. 21. Binder WJ. Submalar augmentation. 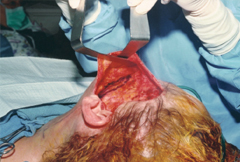 Arch Otaloryngol HeadNeck Surg 1989;115:797–801. 22. Sattler G, Sommer B. Liporecycling: immediate and delayed. Am J Cosm Surg 1997;14:311–6. 23. Hamra ST Composite Rhytidectomy. St. Louis: Quality, 1993.